[30/09/2016 18:53:55] pacofocuspuller a: . [16:27:44] prepafsm2016 extension: katina estas por aqui ? [16:50:36] Katina: Ahora estamos en la parte sobre los visas: hemos desarrollado una guía de apoyo para la obtención de las visas. : Fue difícil este proceso. [16:51:03] Maria Peru: No se ve el video en vivo. Espero mencionen el hecho de que la mayoría que quiso ir del sur global no consiguió visa de parte del gobierno, por más apoyo que se haya brindado. Pregutna 2 Un autre point, un detail: les volontaires devaient payer leur inscription? Prgunta 3 Enfim, sur lê partenariat avec l'université Mac Gil, On a entendu dire qu'ils développent des projetos de recherche sue le controle dês mouvements sociaux. C'est vrai? Ça né pose pás un probleme politique d'etablir un tel partenariat? [18:31:33] Katina: Foro de los medios libres Aislados en la Universidad McGill geográficamente pero buena participación buena participación internacional muchos esfuerzos para conservar la horizontalidad y proceso - Demanda del comité al FSM: participar a la descolonización de los medios de comunicación, integrar más activamente los medios libres ! [18:55:07] Katina: Comite ingresos de base: 7 actividades, 1 gran conferencia- primera vez que ingresos de base esta presente de esta forma en un FSM- trabajaron con grupos internacionales Francia y Brazil - convergencia: hubieran podido hacer más trabajo de convergencia, y de anticipación. [20:09:07] Maria (Peru): Difícil hacer eso si no es un espacio representativo. No debería llamarse foro mundial, sino foro del globo norte. [20:17:57] Katina: ya Maria, acabo de compartir tu comentario, traducido en francés placer ! mas bien gracias de estar con nosotros a la distancia :) otros comentarios acá en vivo ? Otros quieren tomar la palabra? [20:34:02] Katina: Gracias Pierre por tu apoyo acá, poner todos los vínculos web... :) solidarios a todos !!! [20:33:51] prepafsm2016 extension: cesar donde estas ? [30/09/2016 09:01:59] Mamadi (guinee): Thanks for the news Hi Mr Pierre, You are here ? Je vous invite à postuler pour la conférence des jeunes sur les changements climatiques sur le lien www.cojecc.org Les candidature clôture today à minuit. Pour plus d'info écrivez à coy.togo@gmail.com Bonne chance à tous. Can't seem to find the link other than this one? [16:09:12] Norbert: Hi. Anything happening? [16:11:17] Norbert: I am not hearing anything. Is there supposed to be video or sound? [16:35:16] Elizabeth: has it started? [16:40:52] Henri . : Hi everyone, i'm Henri from the FSM collective group in Montreal, to help you. At beginning, Raphael present the methodology after welcoming people in the assembly. We are about 80-90 persons here. [16:42:52] Henri . : Samuel present the arts that we very present during the forum; and now Katina present the Social territory, with the logistic issues we had. No major problems for outside activities. [16:43:32] Henri . : (our video is not working, actually, sorry for that) (trying ). Katina is explaining the -compensation tools- for the eco-responsibility during the forum; we were designated eco-responsible, with the food, the recycling bin, and minimum waste we had Some people are here ? [16:46:53] Henri . : Isabelle, volunteer for all Volunteers in the forum with campaigns. Statistics: more than 100 very implicated volunteers, and 750 volunteers during the forum. ...and more than 180 meetings to 'facilitate' all issues for volunteering, mobilization, orientation ! She is very proud of this implication. [17:06:02] Henri . : new link for video: http://youtu.be/eDI9S2XX_TU . : Sorry for these connection problems...can you hear ? [17:06:56] Henri . : Katina is presenting results on social media, from the communication team-Montreal. Katina talk about the media coverage here, and the translation we had to take care for all the posts on website (fsm2016.org). Our cost for the eco-responsibility chart is the use of ink, paper, and pencils, It was difficult to conciliate the issues. Katina is saluting the trade unions : FTQ, CSN, AQOCI which helped us with logos-communications and medias relations. Thanks to them. [17:11:52] Henri . : Now Therese, from the web team (-web site and operations) Lot of people were involved on the different 'phases' for register as participants and register as organization. to the august 9, : 188,377 visits. [17:17:21] Henri . : Now we gonna hear Sara, for mobilazation. It was a big issue. She was involved in the international relations also, with local teams. A estimation of 62,941 persons contacted locally and internationally. In Quebec province, more than 10,000 contact with people, from the Mob Caravan. More than 10 teams; 4 types of training, with presentation in school, university, civil congress. [17:24:48] Henri . : Now Louis-Philippe, member of Board of FSM collective OBNL . Income projected: with money to come $1G...[17:27:06] Henri . : we received 71% of the projected budget, and we receive some subsidies from organizations, thanks to them, they help a lot for the expenses of this event. Louis-Philippe is also explaining that we had to deal with very tight deadlines, some steps without money, until day to receive in the next months. With income to come and very strict expenses charges, we plan not to be on -deficit- for the forum. Expected total expenses: $1,004,148 CND dollars. [17:32:12] Henri . : Is there some people here in this room ? Can you hear well? [17:32:48] Henri . : Now, question period for 15 min. before perspectives. [17:48:14] Henri . : Other points from the people. some question on the paper-program, with the affected budge Some questions will be answered by Auto-organized Committees. [17:53:28] Henri . : Hi Mirek, glad to see you. You can explain more if you wish. I'M Henri from Montreal. We are taking the pause for 15 min. I'll come back in the room ! See you ! [18:24:00] Henri . : Now: EDUCATION committees So...with a lot groups, and 15 workshops, we were able to do our activities, with some international groups, and a intern budget, for invited people. Some remarks: good to have these in a same place (university); except for Univ. McGill. -some media were missing also. And the agglutination process was missing. Great conferences were very busy, and it is good for everyone. [18:27:58] Henri . : Hi Purna ! welcome here. [18:28:13] Henri . : (we raise the volume in our room). Globally: positive for us ! [18:35:18] Henri . : The Comité Ouvrier' / Labor Group. -10 organizations from working people and syndicates and non-syndicates groups. Thanks for their involvement. The profile for participants is showing this diversity. - a lot of success: with the great march-opening, the workshops, the conferences. So it works, the forum was installed from base-citizens and groups; but organizations had difficulties to find their place in the process. to attract more contribution between each other. - so, some issues are clear: translation, agglutination process, communication relations were a bit hard. so, a bit of work -in silo (separately), instead of more together. With a good participation, and success for our activities. We suggest our obligation for 'the visa campaign' which is very important. [18:42:08] Henri . : Now: Feeling and security team (for the forum). 'against oppression et harassment. (2 persons). they will present their report on some facts for the collective-group; there was some problems during the forum, and they were present to offer support to these after contact with them. They were 5-6 persons acting in this group to offer that support 1 - We did work on anti-oppression attitude during those days. [18:45:23] Henri . : Hi everyone ! we are at 2h45 min. in our assembly ! [18:48:04] Henri . : Now the Committee ALTERNATIVES, SOCIAL AND SOLIDARE ECONOMY (with Hamid) they were missing a guideline procedure from the beginning. -some remarks: some spaces were away from a main spot of activities. -for convergence activity, it was hard to define (for others) the basic principles -we tried to put -in real- the local money discussion from other groups. Thank you ! -a volunteer (to complete): he was a moderator on the Saturday, and we needed for translation, which was easy. with some groups -some activist were there, on Syria, from Morocco, and the debate slide a bit apart. It was not easy sometimes to act in this convergence. [18:57:30] Henri . : Hi Ruchika ! Thank you ! [18:59:35] Henri . : Committee YOUTH SPACE / ESPACE JEUNESSE Now: 'Happy of this event, with 40 organizations, and an intern budget of $50,000 (inside the group). -very happy with the outside space they have, one big show 9one night); and a lot of people passing by, estimation of 10,000 persons. -Future: with some ideas they develop during the WSF. >some remarks: students were a bit missing; -convergence were not done because of time, -and agglutination process was not completed. -one point struggle us...but the platform we organize was good, we need to think about the support direct to -youth- (some were disoriented...) and thanks for the 100 volunteers that works with us ! and the 20 volunteer youths ! [19:06:47] Henri . : Hi Ishaq, welcome ! [19:05:58] Henri . : Now: COMITTEE ENVIRONMENT Tino and friends: we prepare about 300 activities, one big show, and we work with other committees (Palestine, Agricultural, ...) and happy to work with them -other remarks: some difficulties with human resources, some insufficient budget, !The outside space were good. Some actions are now more visible and 'active' in our society -one person is giving a grateful testimony. [19:21:43] Henri . : now: EXTRACTIVISM COMITTEE.FREE TRADE... -a convergence, with 44 groups up to 150 groups, working under a large convergence to larger actions in the future. - with one great conference that was great, with militant and mobilized person on the issues of Environment, extractivism, climate change. -the Visa campaign was not enough visible where we heard (this news) by the people on site. The spot-action was done on street with the 2 daughters of Bertha Caceres (assassinated women in Honduras) there will be more actions coming concerning climate, the minimum wages salary, and others. [19:28:42] Henri . : Now COMITTEE ON SLOW GROWTH. some strategies were plan on the Pasteur Place, to speak about this issue. About 150 persons pass by this space. [19:32:45] Henri . : -goals, issues: some activities were done mostly freely, without money, ; a challenge is learning to speak about -décroissance- /-degrowth- concept, here. -so now, a new project is born to speak bout the idea ! [19:33:55] Henri . : Now: the NCS group -there was about 1,500 persons to their workshops. ; a lot of workshops were presented. The mission was done. -now: what’s the future for our WSF? a real space, some concept, -some criticism will come later, to have a good judgment on that. (with Pierre) -so, the are new groups, and may be somewhere else, with some themes, and new way to re-invent this process. [19:43:59] Henri . : Now the INTERNATIONAL COMITTEE: a lot of groups implicated, a lot of activities, and were done. [19:50:03] Henri . : Carminda explain goals and issues on the process, with difficulties,, that she believes for the future of the wsf -A large report will be written, for everyone, and transmitting information (of committees, groups) who participate in this process. To document this special event and process. [19:54:26] Henri . : Now: exchange period with people in room ! [19:56:57] Henri . : -Some words from a person speaking against -the global context...-was not helping for women-bot invited, -arms in the world, which is very important. [20:01:04] Henri . : Another women: -she is expressing thanks to volunteer people, it goes good for future :-)-also, with the Green School (EVB): they held 'young leaders' activities and it was working very good ! -Youth have a lot to tell, to speak about. Concerning Climate COOP21 and 22, we have hope for everyone ! [20:05:22] Henri . : -A man: talking for voice-less people of the roadless-people. [20:06:13] Henri . : -A man: for the RQIC (in Quebec) about politic issue in this process. [20:13:00] Henri . : -with women fights and mobilization locally and internationally, with our energy. [30/09/2016 09:13:38] esso Togo: Bonjour, Je vous invite à postuler pour la conférence des jeunes sur les changements climatiques sur le lien cojecc.org Les candidature clôture today à minuit. Pour plus d'info écrivez à coy.togo@gmail.com Bonne chance à tous. [30/09/2016 09:38:22] yaya): salut comment vous allez? Je suis amadou, originaire du nord cameroun à garoua aimeraient participer à l'assemblée générale. [30/09/2016 17:38:06] Chloé: Bonjour à vous ! Je serai avec vous demain à 16h (heure de Genève) via ce petit écran. [01/10/2016 00:40:33] Bruno Est-ce qu'il y aura de la vidéo, ou juste du clavier ? [01/10/2016 00:44:04] Bruno: y a t-il 1 seul lieu sur skype ou bien plusieurs en fonction des sujets ? ex. Démocratie / Monnaie locale / doits des minorités / ... ? [01/10/2016 00:46:42] Bruno OK Merci pour l'info. [01/10/2016 00:53:54] prepafsm2016 extension: très bien pour placer l'activité dans la dynamique d'extension il suffit de nous envoyer un message à extension@fsm2016.org qui présente l'activité du 10 octobre - qui organise ? sur quoi ? quand et où ? [01/10/2016 00:54:30] Bruno Je suis un peu perdu dans cette page avec tant de liens. Je cherche celui qui parle des monnaies locales, savez-vous où le trouver ? [01/10/2016 10:03:15] Flora (invité): ah d'accord, merci ! [01/10/2016 10:30:26] darryl Cameroun: Bonjour y aura-t-il personne assurer par écrit et collecter les questions et faire part des interventions des participants en ligne ? [01/10/2016 10:37:12] prepafsm2016 extension: on va essayer ..d'avoir une personne lien à Montréal qui s'en occupe . [01/10/2016 10:53:12] Darna: Bonjour, 2 points importants dont je vous préviens. 2- si quelqu'1 veut m'inviter participer à 1 skype meeting, faudra passer par skype car depuis vendredi une grosse panne technique rend inaccessible ma boîte mail sur Free. Et j'en profite pour alerter tout le monde sur ce genre de désagrément, et qui comme moi, ;) n'a pas pensé à enregistrer ses contacts en dehors de son carnet d'adresses par le net...Erreur que je remédierai d'urgence dès que le lien sera rétabli pour zimbra. J'espère que les activistes d'Asie se manifesteront également. Il y a 1 omerta sur ce continent + qu'en Afrique car la Chine et l'Inde (pays aux paradoxes extrêmes), font partie des grands contrôleurs et écocideurs..!Et pourtant j'en ai contacté(e)s lors du FSM à Montréal. Paraît même qu'il y en a eu qui se sont vus aussi refuser leurs visas, comme ça a été le cas des Africains et des Américains du Sud. J'avais d'ailleurs lancé 1 pétition à ce sujet, à l'époque...il y a une démarche similaire mais plus officielle et organisée par les co-organisateurs du FSM. Moi au courant que 2 jours après = problème de coordination qu'il faudra veiller à éviter, car ça prête à confusion et trop de pétitions tue la pétition, aussi hélà...Alors je prie l'équipe organisatrice du FSM et les autres de rester vigilants sur nos actions similaires. La synergie est + efficace que la dispersion, n'est-ce pas? [01/10/2016 12:59:54] Darna: http://regardsurlafrique.com/ape-une-distraction-au-regard-du-traite-transatlantique-a-venir/ ...et en pj 1 kit de mobilisation Alternatiba contre TAFTA/APE & co, pour vous en inspirer ami(e)s d'Afrique. [01/10/2016 13:19:31] Darna Tant qu'on y est, je me présente en tant que membre de l'équipe Endecocide. Et vous? – Sa dernière édition dans le site est faite par: calendar team/équipe. – Elle a comme thème principal :Theme1 Theme 9 voir https://fsm2016.org/sinformer/axes-thematiques-2016/ . – Elle a une échelle et une zone : national – suisse . – La première d’entre elles a pour lien dans le site FSM : https://fsm2016.org/en/groupes/monnaie-pleine-vollgeld-moneta-intera/ . – Si vous êtes intéressé(e) par cette initiative, appuyer sur le bouton ‘suivre ce groupe’ ci dessous. [01/10/2016 13:31:52] Darna Quelle place d'une monnaie pleine, lorsque l'article 123 du Traité de Lisbonne permet la stratégie politique des dettes pour renforcer le contrôle par ceux qui se sont déjà partagés le Monde, voire même l'Espace...lors du Sommet de Yalta? [01/10/2016 13:45:33] Chloé: En Suisse on n'est pas sous le régime de Bruxelles mais on a la loi équivalente qui interdit à la Banque centrale de faire crédit à (donc créer la monnaie pour) l'Etat. L'initiative Monnaie pleine inverse ce principe et redonne le pouvoir à la Banque centrale (la Banque Nationale Suisse) de faire crédit à l'Etat, et empêchant les banques commerciales de créer la monnaie et en redistribuant un revenu à tous les citoyens suisses. [01/10/2016 16:06:45] Darna Merci Chloé. Et concernant la valeur monétaire indexée de + en + sur des valeurs fictives et des transactions souvent trafiquées..? [01/10/2016 15:23:29] Emmanuel (France): Bonjour, on m'a demandé de représenter le Médias libre à l'Assemblée ouverte de samedi 1er octobre. Où et comment ça se passe ? [01/10/2016 15:32:00] Emerson (brésil): Bonjour! [01/10/2016 15:51:23] Françoise (France): Bonjour c'est Françoise je représente la monnaie locale de notre région sud est de la France, Comment est-ce que je me connecte ? Merci de m'accepter comment fait-on pour rejoindre la conversation je ne peux pas vous appeler est-ce parce qu'il y a dejà trop de monde ? [01/10/2016 16:01:08] camille Hello, c'est vous qui nous appelez quand ça commence j'imagine ? [01/10/2016 16:05:15] Françoise je suis sur skype mais je n'ai pas accès ni au téléphone ni à la caméra, pourquoi ? [01/10/2016 16:07:25] Henri . : Ci-dessus, le lien pour vidéo en direct via YouTube .On vous souhaite la bienvenue à toutes et tous ! [01/10/2016 16:09:37] Merzouk: Bonjour, pourrait on avoir accès aux slides de la présentation comme pour les précédentes assemblées svp ? [01/10/2016 16:10:58] Henri . : Le diaporama s'en vient Nous n'avons pas encore commencé... Oui on y voit ! Le diaporama sera présenté sur l'écran, bientôt. .: Pierre: Katina est arrivé et pourra faire une salle -Espagnol- Avec la vidéo qui partira pour le départ. [01/10/2016 16:13:18] Chloé: Comment on sait quand ça commence ? [01/10/2016 16:19:13] Henri . : Nous débutons, avec Isabelle. Entendez-vous Robert et isabelle? [01/10/2016 16:22:35] François: image ? [01/10/2016 16:22:47] Nikolas c est qui, qui parle? [01/10/2016 16:22:57] Chloé: Comment je fais pour participer en vidéo? [01/10/2016 16:23:09] Henri . : Isabelle, assistante à la coordination générale. Ah c'est mieux....le son. [01/10/2016 16:23:43] Henri . : Pierre: Katina aura la connexion dans 3 min. [01/10/2016 16:24:29] Chloé: On ne se parle pas en vidéo ici ? ?On se contente de commenter ? [01/10/2016 16:25:29] deb. (invité): Comment voir le vidéo? [01/10/2016 16:26:15] Françoise: c'est Robert qui parle ? [01/10/2016 16:26:22] Nikolas: est-ce qu’il y a une possibilité pour que le son devient plus forte? [01/10/2016 16:28:06] deb. ): Henri, bonjour, Pourquoi je ne peux pas voir les images? [01/10/2016 16:28:15] Darna: 1 question à Henri: y a-t-il eu des participations d'ONG asiatiques? [01/10/2016 16:28:54] Henri . : Darna: oui quelques-unes qui sont aussi sur le site web dans les activités 3 organisations. je travaillais à la -programmation dans notre groupe de travail. [01/10/2016 16:30:03] Darna: En annexe et quand tu pourras respirer, pourras-tu partager leurs contacts/lens vers leurs ONG respectifs, stp? [01/10/2016 16:37:18] Darna Pareil pour moi, merci Hélène. [01/10/2016 16:37:37] fleures: De rien.!?? [01/10/2016 16:40:07] Henri . : Katina présente le territoire social mondial, couvert au centre-ville de Montréal. [01/10/2016 16:41:22] François: quid ? rien plus rien ? [01/10/2016 16:51:22] Merzouk: Merci Henri !! [01/10/2016 16:52:36] Henri . : Merci à vous ! je vous ai donné le lien pour le Power point...on le suit ici. Powerpoint presentation because we have connection problems on the net. [01/10/2016 16:54:39] Darna Donc si je consulte https://docs.google.com/presentation/d/1HaBo1P-q7aWvR5sKbENDmykt5O6nx5x6InDWXVQyysw/edit#slide=id.p4 plus tard, j'aurais aussi la suite du meeting? [01/10/2016 16:54:40] Henri . : yes, from Latin américa, and Europe also. There are still, actually, somme demands in stand-by, and with the cost to get -a file- was up to $500...For visa, it was a Shock for us too ! Safa is inviting organizations to contact her and the collective to continue this action (revendication) here in canada. Now safa is talking about housing for people here. Most of demands were satisfied. [01/10/2016 16:58:42] Henri . : Concerning crowdfunding, 7 projects from outside were able to complete their issues and to hold their own activity, (over 25 planned at the beginning...). [01/10/2016 17:00:17] Darna Bon alors je préfère que vous épluchiez les questions déjà posées avant maintenant (dont les miennes, svp), afin d'y répondre à "tête reposée", parce que là, vous les techniciens me font penser aux divinités hindoues à plusieurs claviers..! :D Je rigole mais ne vous envie pas et vous souhaite beaucoup de santé. Olé! [01/10/2016 17:00:33] Henri . : Concerning interpretation (instant translation), we had 76 volunteer, in which 36 professionals were present. We were able to cover Convergence Assemblies, some Big conference, Room in -English- here. Thanks ! [01/10/2016 17:02:11] Henri . : Concerning food supply and nutrition during the forum, we had some success, and some goals not satisfying. Oups, je crois que je me suis trompé entre les langues...excusez-moi ! [01/10/2016 17:19:00] Nikolas Schall: est-ce que tu pourrais tourner le camera une fois pour qu’on a un idée de l audience? [01/10/2016 17:43:33] prepafsm2016 extension: Carminda - le FSM expérience positive pleine de défis ..
[01/10/2016 17:46:47] darryl Cameroun: Est-ce que nous pouvons avoir la liste des pays qui sont candidats pour l'organisation du prochain FSM? [01/10/2016 17:50:00] Darryl Cameroun: Encore un pays du nord candidat ?Vraiment je crois nous n'avons pas retenu de leçons de l'édition du Canada: Nous voulons plus de FSM dans des pays où l'est demande aux membres de la société civile d'être riche avec des comptes bancaires pleins pour avoir les visas. [01/10/2016 18:09:52] Nikolas au revoir. il faut que je me vais. Merci pour votre effort. [01/10/2016 19:00:03] prepafsm2016 extension: miguelle vous êtes la ? [01/10/2016 19:05:41] prepafsm2016 extension: (c'est un investissement énorme qui a les ressources pour cela ? ....) avez-vous un budget pour cela darryl une estimation ? [01/10/2016 19:06:43] Modibo (mali): Pourquoi ne pas aller en partenariat avec Afrique Media? [01/10/2016 19:24:04] François: ok lien ? [01/10/2016 19:24:20] Chloé: Ok ! [01/10/2016 20:12:31] Darryl Cameroun: Ce budget est prévisionnel Nous avons prévu une méthode très simple pour collecter les fonds. [01/10/2016 20:16:47] Darryl Cameroun: Nous ne savons pas exactement comment procéder pour présenter l'intégralité du projet. [01/10/2016 20:24:11] Darryl Cameroun: Mais allons lancer l'entame de la collecte des fonds d'ici peu de temps. [01/10/2016 20:27:45] Darryl Cameroun: Et à propos des visas qu'est ce qui a été dit exactement ? [01/10/2016 20:43:06] François: et la Suisse ? [01/10/2016 22:06:22] François: CI-DESSOUS VOUS TROUVEZ UNE LISTE DE MANIFESTATIONS, TRIÉES PAR DATE, EN LIEN AVEC L'INITIATIVE MONNAIE PLEINE. 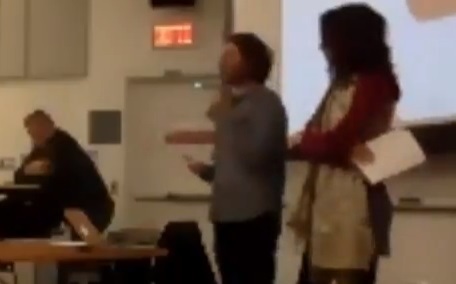 Conférenciers : Virgile Perret a obtenu un doctorat en science politique à l’Université de Lausanne pour lequel il a reçu le Prix de la faculté des sciences sociales et politiques en 2013. Auteur d’un ouvrage sur le thème « Monnaie et citoyenneté », il a enseigné les relations internationales à l’Université de Lausanne. Il collabore actuellement avec l’Observatoire de la Finance à Genève. Pierre Mottier Master en sciences, enseignant, Sion, membre du comité d’initiative Monnaie Pleine. Engagé dans les questions d’éthique et dans la promotion de monnaies secondaires et de solutions locales aux problèmes économiques. Jean-Marc Heim juriste, Lausanne, secrétaire du bureau romand Monnaie Pleine et membre du comité « Association Modernisation Monétaire/Initiative Monnaie Pleine ». [01/10/2016 22:19:23] Darna: Sur la monnaie libre, on en reparlera demain, comme convenu, svp. En sachant que la confusion entre la notion d'économie et celle de la spéculation devra être évitée. J'aurai des questions sur l'indexation des valeurs et des prix. La Suisse a toujours su se préserver des turpitudes politiques mondiales par sa neutralité, mais n'a accepté récemment de remettre en cause son système de niches fiscales et autres blanchissements d'argent. Perso, je suis plutôt pour carrément remplacer le PIB par le BIB Bonheur Intérieur Brut. Car si l'1 est basé sur la surexploitation des ressources naturelles et celle des populations, l'autre définit le réel niveau de vie en fonction des besoins. A ne pas confondre non plus avec les caprices qui, de + en + sophistiqués et malsains chez une minorité du Nord, a mené à la dangereuse accélération du réchauffement climatique actuel...n'est-ce pas? Cette Assemblée sera l’occasion de faire un retour avec les différents acteurs et actrices du FSM 2016, presenter le rapport final pour les partenaires et entrevoir les prochaines étapes du processus que nous avons mené ensemble. Nous vous rappelons que le 12e Forum Social Mondial (FSM) est le plus grand rassemblement de la société civile globale, visant à trouver des solutions aux problèmes de notre temps. Le FSM-Montréal 2016 marquera l’histoire comme étant le premier événement de ce genre à se tenir dans un pays dit du Nord. En effet, depuis sa création à Porto Alegre (Brésil) en 2001, le FSM n’a eu lieu que dans des pays du Sud (Amérique latine, Asie, Afrique). 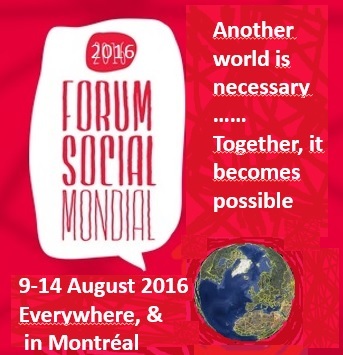 You are cordially invited to the next WSF 2016 Open Assembly. When : Thursday, October 1st, 10 a.m.-1 p.m. This Assembly will give the opportunity to debreaf with the different actors of the WSF 2016, present the final report to partners and foresee next steps in this process that we undertook together. We remind you that the 12th World Social Forum (WSF) is the largest gathering of global civil society, aiming to find solutions to the problems of our time. The Montreal WSF 2016 will make a mark on history as the first event of its type to take place in a Northern country. In fact, since its creation in Porto Alegre (Brazil) in 2001, the WSF has only taken place in Southern countries (Latin America, Asia, Africa).